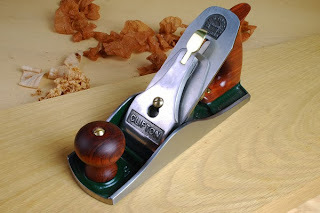 Five years ago my wife gave me a beautiful smoothing plane for Christmas. At the time I already had a smoother, but it had no sentimental significance and I had no qualms whatsoever about selling it to make room for my beautiful new one. That handplane is the one that I use to put the final surface on a piece of timber, to create the surfaces by which my skill and craftsmanship will be judged. It is one of my favourite possessions and five years on I still think about her every time I pick it up. The best gifts are things that the recipient will use, treasure and adore; whatever the item may be, it should always be of excellent quality. Make a list or, even better, a pinterest board, of things that you would like to receive as gifts. This is especially important with woodworking tools, as quite often the person buying it for you doesn't have the first clue what they are looking at. Don't be afraid to ask for expensive things, relatives often prefer to club together and buy you one really awesome present instead of each getting you something smaller. Give yourself plenty of time; driving past a crammed supermarket on Christmas eve when your presents are all safely wrapped up is pure schadenfreude! Informative post Mathew. I like tip 2 & 3, and will have to set up a pinterest board for stuff I like. When asked for what I would like for christmas etc my mind goes blank and all I can think of is the 50 acres of woodland and the small cottage with a large timber framed workshop powered by a large waterwheel. Bit big for a stocking filler Sean but what a wonderful vision. Will your workshop be set up for green wood or dry? How do you sharpen a gooseneck scraper?